Today's Inspiration: Norman Rockwell and "the great J.C. Leyendecker." Norman Rockwell and "the great J.C. Leyendecker." Norman Rockwell referred to him as "the great J.C. Leyendecker." 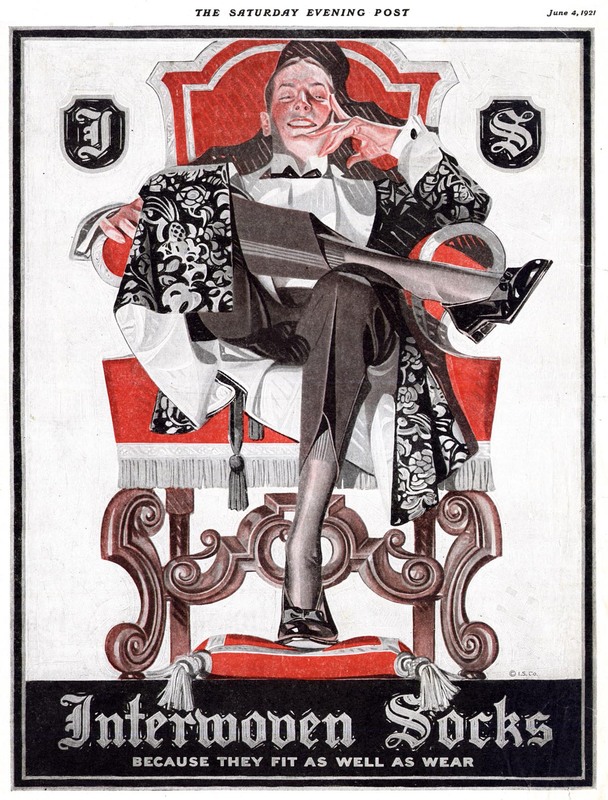 In Rockwell's autobiography, "My Adventures as an Illustrator," he acknowledges Leyendecker's influence and inspiration and devotes a chapter, "The Mansion on Mount Tom Road" to Leyendecker. He tells of their first social evening when J.C. and his brother Frank were invited to the Rockwell's home for dinner. Rockwell hired a cook to prepare a Thanksgiving dinner in July, complete with turkey and trimmings. After a very awkward beginning of the evening, they were called in to dinner. When the cook came through the kitchen door with the turkey, she slipped on the edge of the rug and the turkey rolled under the table. Rockwell crawled under the table from one side and Leyendecker from the other. They met over the turkey which was lying on its side with stuffing gushing from its breast. "That smells good," Leyendecker said as he tasted the stuffing with his finger. When the turkey was put on another platter and dinner was served, the conversation and laughter flowed and the artists became fast friends and remained friends for over twenty-five years. 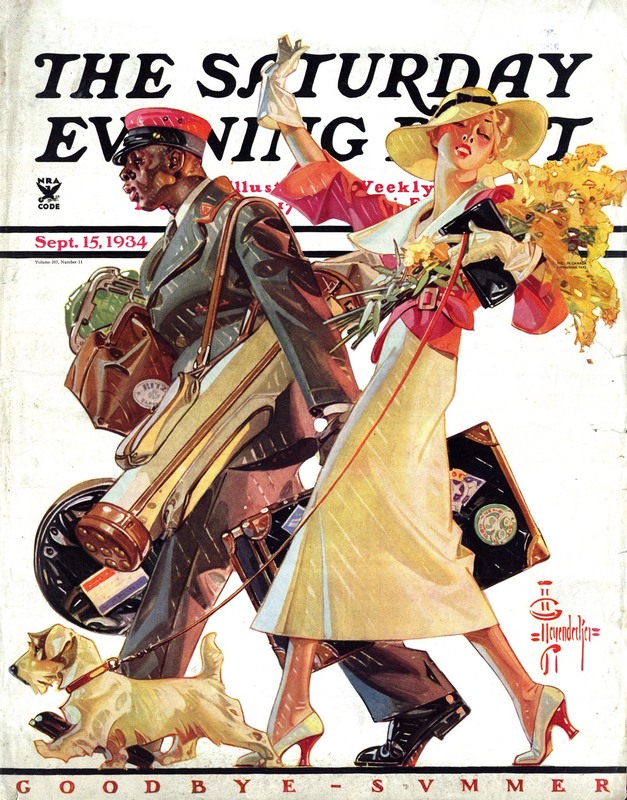 J.C. Leyendecker created 319 covers for The Saturday Evening Post. 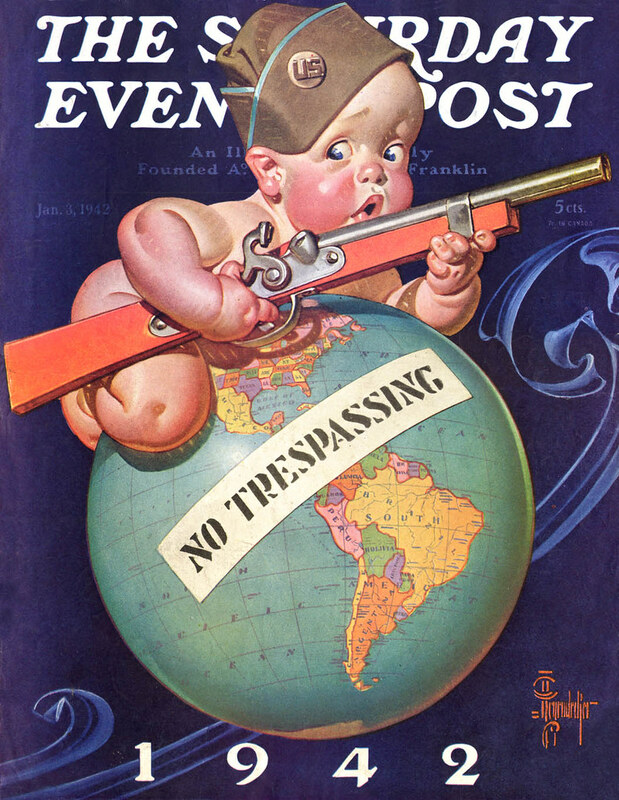 From 1903 to 1943, as one of the top cover artists, he was commissioned to do holiday issue covers including Thanksgiving, Christmas, New Years, Valentine's Day, July 4th and the forerunner of President's Day. He employed the Pilgrim and the turkey to signify Thanksgiving, Uncle Sam for July 4th and, in 1906, created the icon of the new-born baby as an emblem of the New Year. This became his own trademark. Although his illlustrations appeared regularly in national magazines, it was his commercial work that established him most rapidly as one of the most sought-after illustrators of the day. 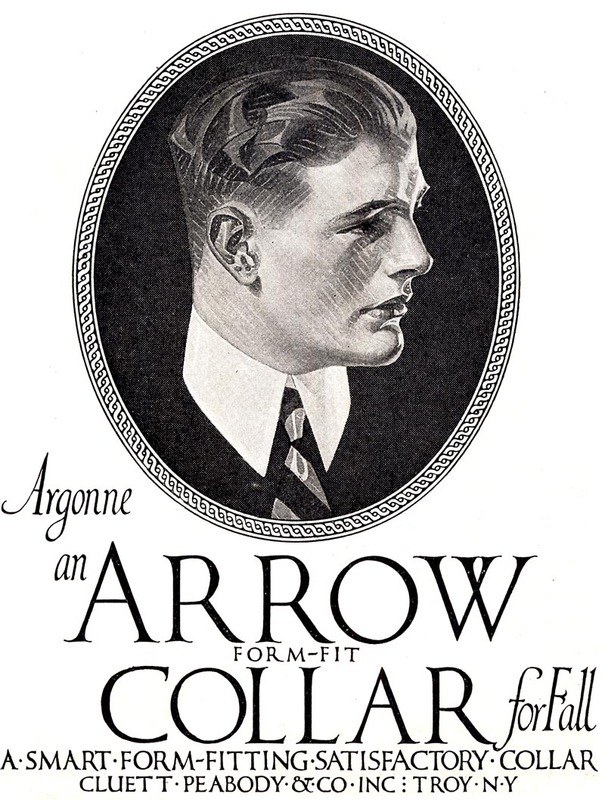 The "Arrow Collar Man" became an overnight sensation and generated fan mail by the ton. 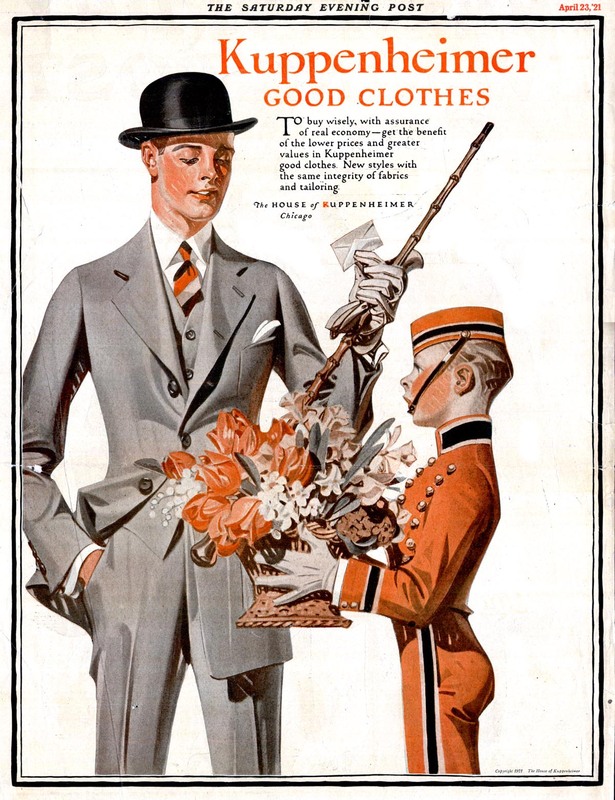 By evoking a youthful virile atmosphere, Leyendecker pioneered the advertising dictum that it is the lifestyle that sells. He established the prototype of the stylish American Male promoting fashions by B. Kuppenheimer, Hart Schaffner & Marx, and Interwoven Socks. Born in Montabaur, Germany, J.C. Leyendecker emigrated to Chicago with his family in 1882 when he was eight. His career began in 1896, when he won first place in The Century cover competition and a commission to design a year's worth of monthly covers for The Inland Printer. Famed illustrator Maxfield Parrish won second prize in that same competition. With his prize money and savings, he and his younger brother Francis Xavier decided to study in Paris, where they remained over one year. Around this time, the brothers developed a credo which was as effective in compelling them to produce their best work on time. "Buy more than you can afford...If every day you have to save yourself from ruin, every day you'll work." When they were young and successful, this credo could he a fun game, a kind of race for each to outdo himself and the other. They made and spent large sums of money, dwarfing the previous income benchmarks for an illustrator. The culmination was the building of a chateau in New Rochelle with a separate wing for each studio. 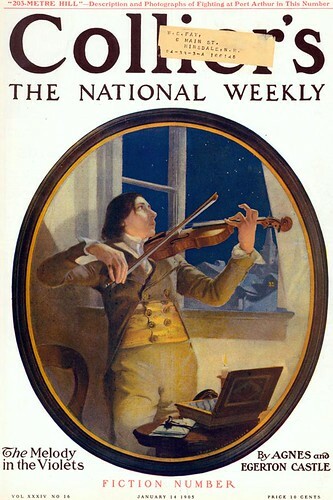 Frank was an excellent artist in his own right and executed a spectacular series of monthly covers for Collier's Weekly magazine from 1902 to 1905. At this point, he was the higher-profile of the two brothers. However, the competition between the brothers caused Frank to work at a killing pace, and Joe, a formidable pacer, soon outshone Frank. Eventually the same bond that held the brothers together split them apart. If Leyendecker's stature as an illustrator is invulnerable, the few known details of his life stand in stark contrast to his self-spun myth of artist-as-superman. In person, he was very shy and spoke with a stutter. Moreover, he was homosexual in an era when exposure meant ruin. He lived as a virtual recluse, locked in struggles of power and love in an ivory tower, and driven by impossible goals, leading to tragedy. * Today's text is courtesy of the Norman Rockwell Museum, and is modified from Roger T. Reed's catalogue text from the 1997-98 Leyendecker Retrospective show. * The Frank Leyendecker Collier's cover in today's post is from the Flickr collection of James Blah. I'm glad you found a copy of Roger's essay. I hope some day he'll be able to do more in-depth work than a brief monograph, as he certainly has the knowledge. Jaleen; I checked with Roger and this is not exactly his essay - its material from his essay mixed with some other text from the Leyendecker retrospective he curated. He suggested I credit it as I did so as to eleviate confusion... but I guess it needed further explanation. Many years ago I read about Rockwell's recollection of the near disastrous dinner party that he hosted for the Leyendecker brothers, and I visualized it as several possibilities for a Leyendecker SEP cover illustration. 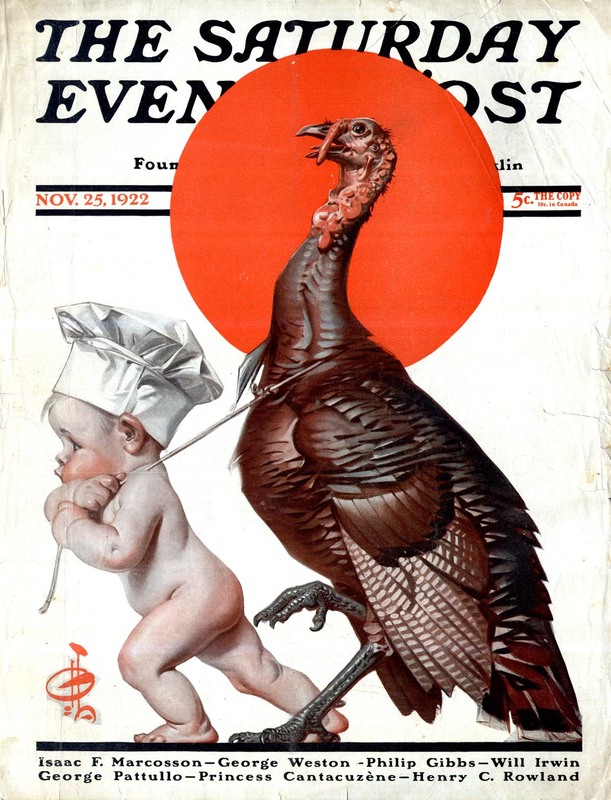 The cook slipping on the carpet and the turkey in mid air, on its way to the floor, with those at the table gasping in horror, or Leyendecker under the table, tasting the stuffing with his finger. 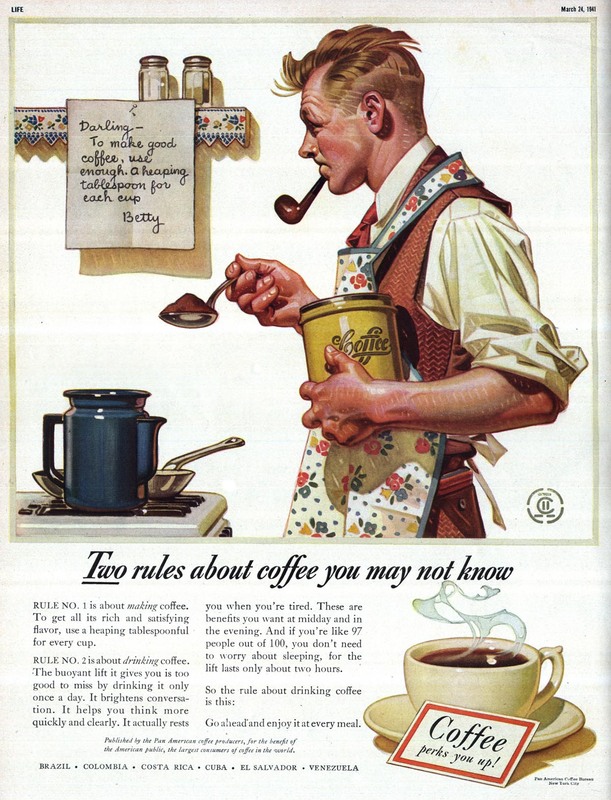 For those who have written in recent times, that Rockwell and Leyendecker's America was a myth, they know little about Rockwell the man, or about American culture. I, and others I know, witnessed many of those Rockwell SEP cover scenarios in our daily lives. My parents and grandparents told me their recollections and anecdotes about their youth, that paralleled many of the early Rockwell and Leyendecker covers. That was not simply wishful thinking or "idealistic nostalgia" that some writers have suggested. Rockwell was quoted many times, that he got his ideas from, and painted the life he witnessed around him. If anything, he made it less ideal and more true to life, by using real people, not beautiful people as depicted in the women's magazine stories, ads and romance novels. IMO, that is why Rockwell's work survived so many decades. He painted what the majority of people could understand and relate to. 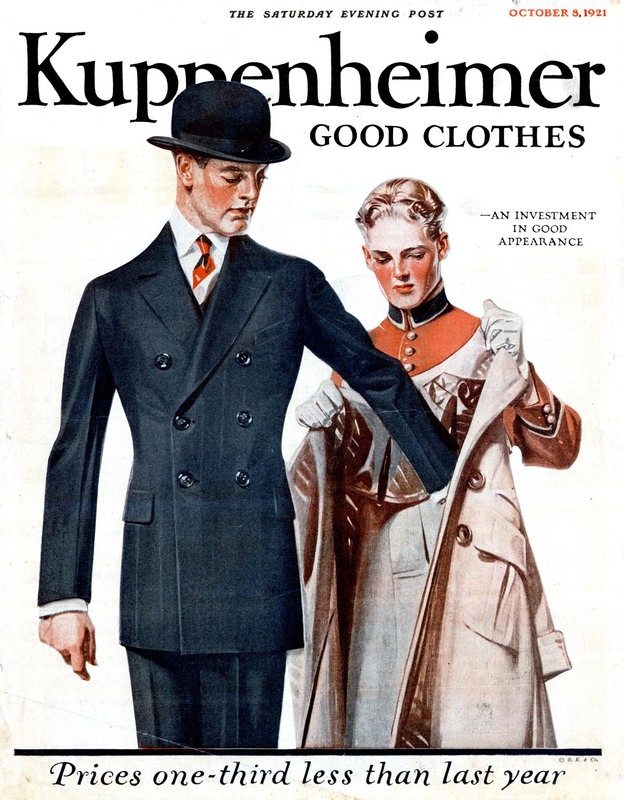 Although Leyendecker and Rockwell painted from the same mold, Leyendecker maintained the same look and depicted life from the same era, as when he was at the height of his popularity. By the end of his career, sadly he was considered virtually insignificant and ignored as an illustrator. 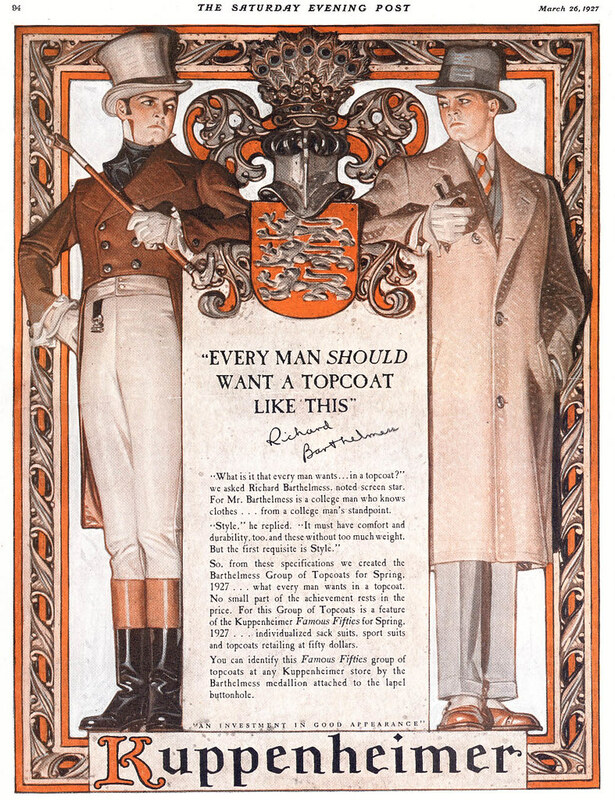 Even Rockwell recalled that Leyendecker became mannered and predictable in his work, later in his career. Rockwell worried and worked hared to avoid becoming outdated. However, IMO few illustrators or fine artists have ever actually improved their work by changing it, after the peak of their career and popularity. 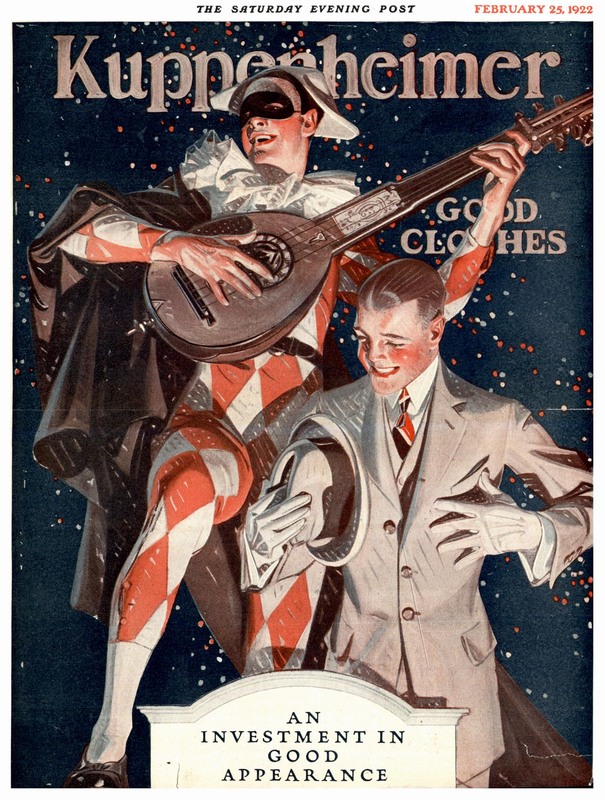 The great Leyendecker indeed! So glad his work is being recognized. Scott; Thanks for the heads-up -- I had no idea we had some Rockwells in the neighbourhood. I'll certainly make the trip to McMichael this summer for that treat! I too witnessed (and participated in) many of the scenarios Rockwell portrayed in my youth in the '70s. I was fortunate to witness and participate in them again when my own children were young & now again with nieces and nephews and children of friends. Rockwell's people are as present today as they were in your youth and your grandparent's; only the clothes, hairstyles and circumstances of their lives may have changed. Children are still mischievous, young lovers are still romantic, couples still stand together through sickness and health, politicians are still windbags and farmers are still proud salt-of-the-earth types. IMO some people (especially some people of a certain age) understandably have edited their memories of what the world was like back in the 'good ol' days'. Its always amusing to read the reminiscences of older people from a hundred years ago complaining about the younger generation of their era. Each generation seems to view their own youth as ideal and thinks the world has gone to hell in a hand basket in the ensuing decades of their life. I think Rockwell's work endures because we continue to recognize ourselves in it. The majority of people still understand and relate to Rockwell's people. IMO the issue is not with Rockwell portraying a 'mythological' America - IMO its with those who seem to suggest that Rockwell's portrayal of society was the entire reality of society at that time. They are the mythologizers - not Rockwell. I suspect that those who in recent times have written that Rockwell's world seems like wishful thinking are not reacting as much to his pictures as they are to those who have trouble admitting that Rockwell didn't paint the entire picture. I am glad to hear that we have similar views of Rockwell and the life he portrayed. I was fortunate to have parents that did not feel that life was so much better when they were growing up. In fact, they relished some of the conveniences that life had after they became adults and started raising kids. I never heard them criticize or frown on rock and roll or teenage styles and fads, etc. My mom was a teenager in the 1920s', and it was a period of rapid change and fads, also. I don't personally recall a big concern during the 50s' from the older generation among our friends or acquaintances, but I am sure there were those that complained of any change in society. Perhaps today Canada still harbors and continues to value many of the Rockwell cover scenarios, more so than American society.. and I mean that as a positive comment. However, I'm drifting off the road a bit. 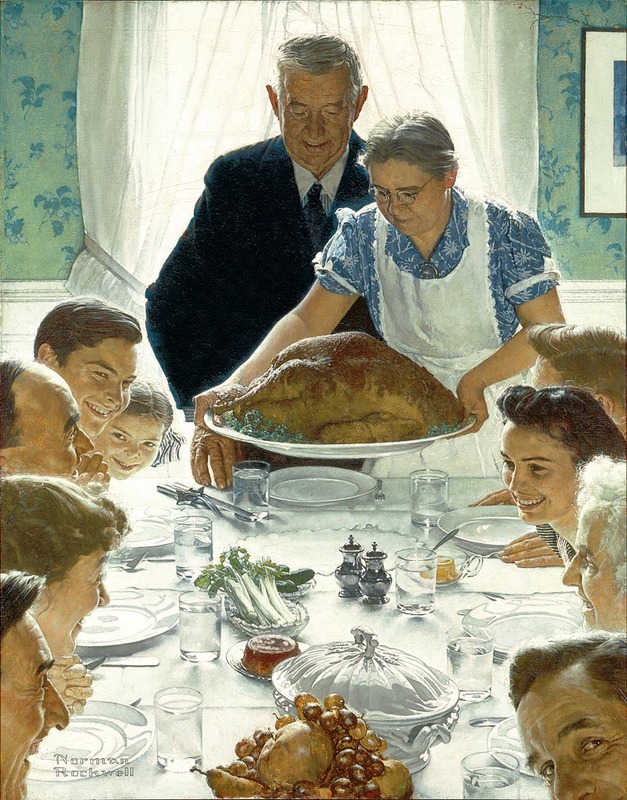 IMO Rockwell portrayed the essence of what life was like in America and also Canada. 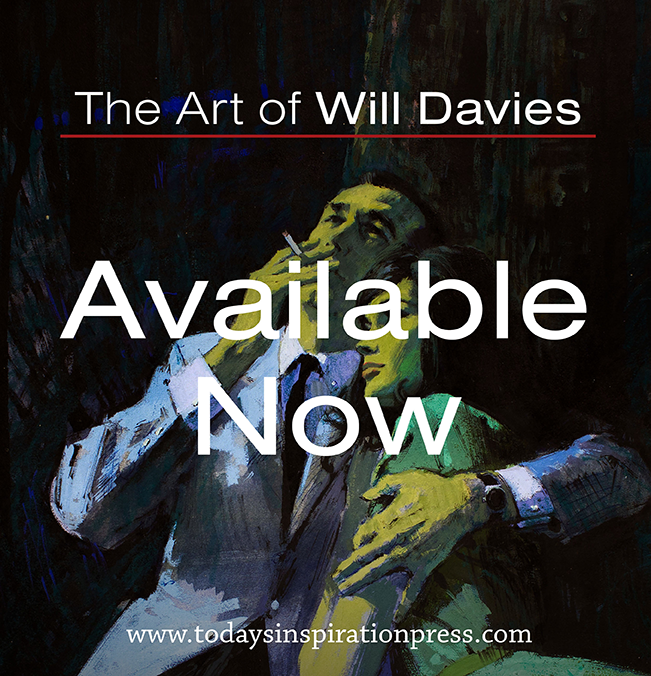 He didn't want to illustrate the horrors of war, the brutality of the mafia, civil riots or the raw gritty side of society. Although, during the civil rights movement in the 60s', he did one very uncharacteristic illustration for, I think Look magazine. I won't reveal what it was in case you plan on posting it.